The paper-free way to keep track of your training, this smart card captures your workout data directly from your PM3 or PM4. Simply insert the LogCard into the monitor before your workout, and the monitor will store your workout data on the LogCard when you’re done. Compatible with PM3s and PM4s only. Similar in size to a credit card, the LogCard fits easily into your wallet so you can take it with you…especially handy if you work out in multiple locations. The Performance Monitor lets you store your five favorite workouts. You can store an additional five on your LogCard as well, making it ideal if you have lots of favorite workouts, or if you want to set them up quickly on a different machine. Have more than one person using the machine? No problem! Each LogCard can store data for up to five people, so you can all share one LogCard. Once you have data on your LogCard, you can use our free Concept2 Utility to upload that data to your Concept2 Online Logbook or to a spreadsheet on your computer. 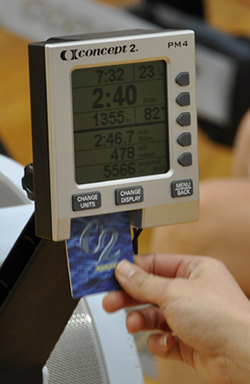 Simply connect your Performance Monitor or external card reader to your computer and use the Concept2 Utility to manage the data on your LogCard.